Right at the onset of this article, let’s get the fairly obvious done and out-of-the-way, and that would be comparing the latest reboot of the beloved character from Dark Horse comics to Benicio Del Toro’s version, a duology, the last one of which released back in 2008, following which the producers and Del Toro struggled to bring a second sequel to fruition. There is no denying that Del Toro’s version was better, and Ron Perlman looked like he was born to play the role. You get to appreciate the characters and designs, and Hellboy’s backstory coupled with a good degree of fantasy-escapist fun, all of it PG-13, and good-natured charming fun, everything that the monsters and characters aren’t, which is an achievement if you ask me. Come 2019, and the reboot is throwing severed limbs and heads and splatters of blood at the screen every ten minutes, sometimes even the more frequently. While almost equally encompassed in a completely fantastic world, the film comes undone many a time because of the excessive gore. While I will break down how the film fared for me, and why the comparison and its result is so obvious in the last section of the article, I will also state, unlike many of the reviewers out there that have completely shunned the film, that there is some stuff to like here in this CGI gore fest. One of its major strengths: its fantastical world while not as wildly imaginative as Del Toro’s (the man-made Pan’s Labyrinth for god’s sake), is way closer to the comics than Del Toro’s version was, or even intended to be. This is the reason why fans of the original comics will enjoy this more than the average movie goers, who by the way will have no clue what the hell is going on. 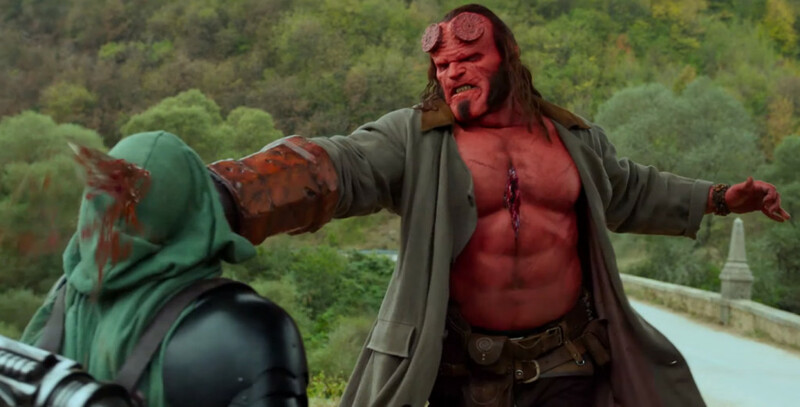 The second reason, for starters, would be our new Hellboy, David Harbour, who is sincere in his role to say the least and comes very close to Perlman’s now legendary portrayal of the character.The CGI is definitely better, as is the work by the makeup department: some of the monsters (especially Baba Yaga whose rendition I loved) are terrifyingly good, lending the film some of its better, goth-horror vibed bits. Where Hellboy falters is its visibly tiring charade of trying to be everything at once, visibile from its storyline and writing that has little room for breathing, and the frenetic editing amongst all the CGI dismemberments and blood, and still trying to appeal to the blockbuster typology of films, in the process a similar audience too, despite taking the brave step of being an R-Rated comic book flick. While this is as much as a consensus you will need to decide whether to watch the film or not, there is plenty of room for a sequel about which you will learn in the sections to follow, which also means that there is plenty of room for improvement. 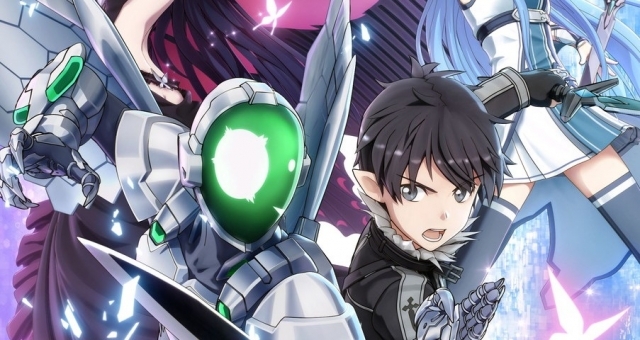 Read on to find out about the easter eggs, prospects of a sequel, and what that ending meant. The good news is that there is nothing wildly unpredictable or twisty about Hellboy’s ending. We knew, ever since from the first look at the trailers that Nimue the Blood Queen, the primary antagonist of the film, being played by the ageless MillaJovovich, would wind up dead. She is the typical origin story villain: hell-bent on the apocalypse and stopped by our hero conveniently close to the ending, but not killed off completely so as to not kill of prospects of a future appearance. Don’t get me wrong, she is a very serviceable villain, even earnestly likeable at some points, with completely understandable character motives: because what’s a witch to do other than end the world or bring about hell? Anyway, the end of the film occurs in two typical segments: one, which is the end to the storyline of the film in general, and the second, that shows how our heroes team up in the aftermath of the first and continue combating supernatural threats. Here, we expand on both. For expanding on the first, we rewind to when Nimue regained all her powers and would now seemingly proceed with infecting the world with her plague, that through some news clippings and frantic cries is revealed to be slowly spreading from Britain to the rest of the world. 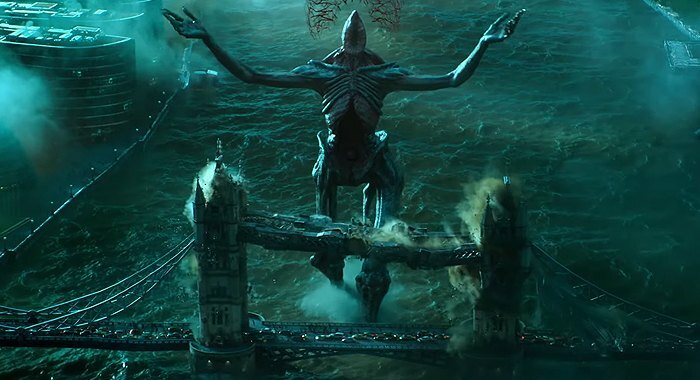 The newly formed trio of Hellboy, Alice Monaghan and Ben Daimio reach St. Pauls Cathedral where Nimue is supposedly hiding, but are instead confronted by a mutated and much larger Gruagach. While Hellboy battles him, in what is a scream worthy moment for true fans, Daimio turns into his jaguar form and aids Hellboy in his fight with Grugach. As the battle proceeds to be increasingly one-sided, Nimue appears and betrays her loyal disciple, Gruagach, killing him in the process and asking Hellboy to join her by becoming her king, something that Hellboy knows through visions will bring about the end of the world. He naturally refuses, but is directed to a secret crypt beneath the Cathedral, housing the secret tomb of King Arthur, along with the mythical Excalibur. The murderous witch then kills Bruttenholm (Ian McShane, who plays a charming Professor Broom)upon Hellboy’s refusal, who now enraged, pulls Excalibur out of the stone, literally raising hell, causing monsters to emerge from the depths of the Earth and killing civilians in the most gruesome ways possible, bringing about the onset of the apocalypse. 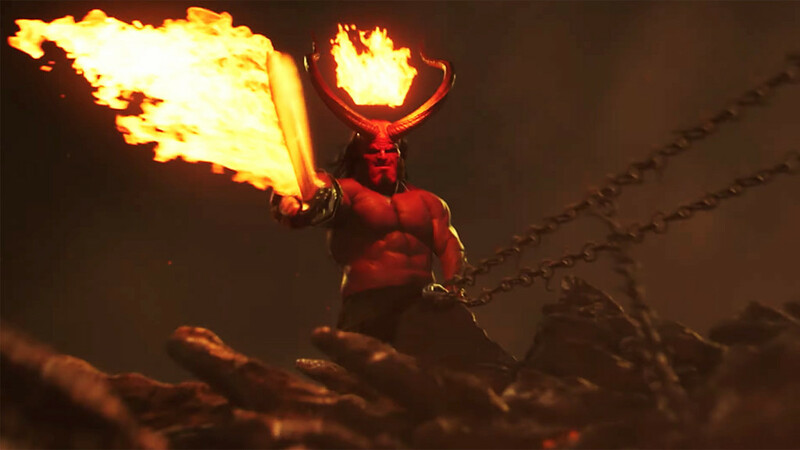 While the proceedings may appear grim in themselves, I could not help but gush over Hellboy’s demonic form that he gains as a result of lifting the now flaming Excalibur. For the lack of a better word, this one scene and the bit wherein Hellboy has a vision of the apocalypse, with him riding a fire-breathing dragon, are pure and absolute badassery, and fan servicing at its dubious best. 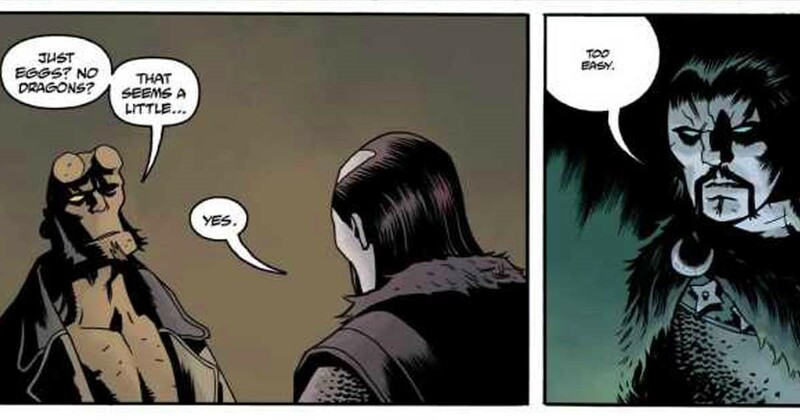 Sensing the wrong, Alice goes and uses her powers to summon and channel Bruttenhom’s spirit, one who reminds Hellboy of his humanity and appeals to it, the way every father figure does in a comic book adaptation, albeit here it’s cheesier than usual. However, we listen since its Ian McShane talking. Presumably and expectedly so, Hellboy snaps out of his infuriated state of hellish vengeance and instead decapitates Nimue’s head, purging it into the fires of hell revealed from the floor of the cathedral as Hellboy plunges the sword into the ground earlier. 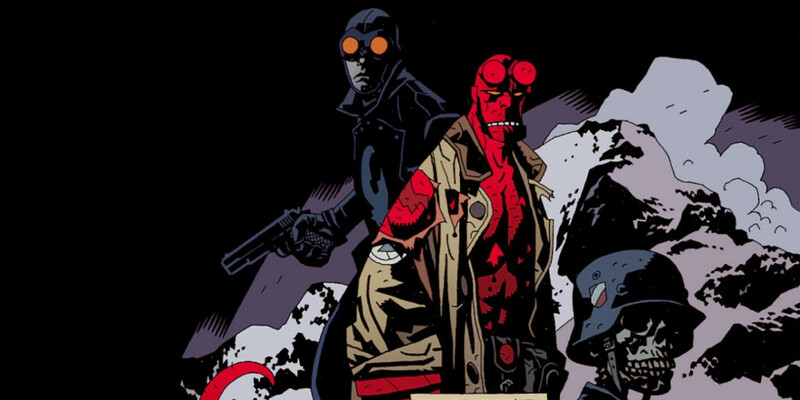 Hellboy returns to his normal form, the apocalypse is reversed with monsters and demons returning to the depths, with no word on the slaughtered civilians still. 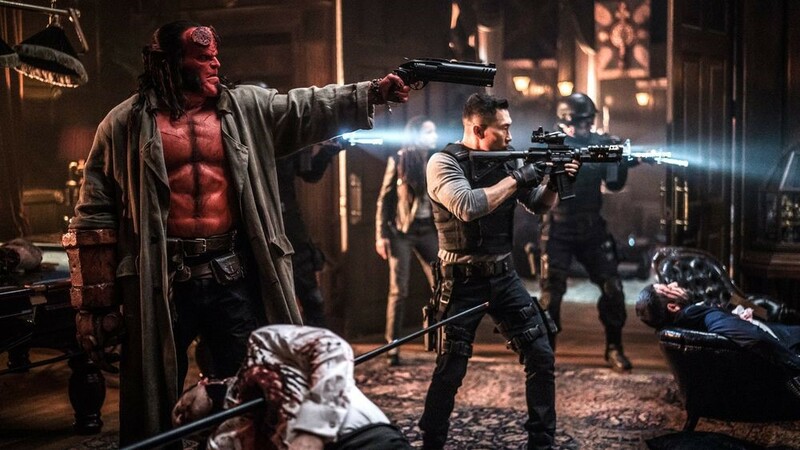 Him and Bruttenholm exchange some final words and advices, as they bid farewell to each other, and we see Daimio getting rid of the special bullet he got made for killing Hellboy earlier on in the film, with his faith in Hellboy now restored. Onwards to the second one now, that is ushered in following a six month time shift in the film. Half a year later, we see the trio now working for the BPRD (Bureau for Paranormal Research and Defence), with Alice too now a part of it, given her astral powers. She now has a pair of magical knuckle dusters, and could form a potentially badass sidekick. The trio proceed to raid an underground cult as Daimio once again transforms into his were-jaguar self, as the three are shown fighting cultists side by side through swiftly panning cameras and shifting focuses. As the fighting stops, the three curiously glance over a water tank, and as they proceed closer toward it, an amphibian hand hits the glass of the tank from the inside, and the screen cuts to credits. Fans would instantly recognise the character to be Abe Sapien, a long running member of the BPRD and a fond friend and ally for Hellboy. 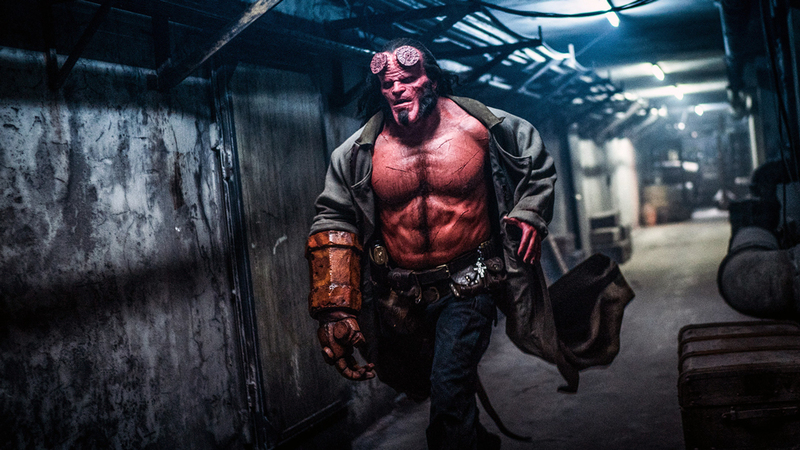 The character’s appearance isn’t as much a mystery now as it used to be for an oblivious audience before Del Toro introduced the character in his Hellboy films, and retained him for the sequel. Interestingly so, here is an exciting piece of trivia. Whereas the 2019 version only barely hints at and introduces the character, Del Toro’s films significantly impressed upon the character and his fictional biography in a way that he proved instrumental to the happenings of both films. Undisclosed in the credits here, Doug Jones played the character in the earlier two Hellboy films. Where it gets interesting is that the same actor also played the amphibious man in Del Toro’s Oscar winning fantasy romance, ‘The Shape of Water’. Marvel and the MCU may not have revolutionised moviemaking or storytelling, but they sure have to be credited for introducing that tingling feeling in the audience: to stay after the credits. While for any MCU film, it is practically blasphemy if you leave your seat before both end credits sequences, you sure struggle when it comes to another film of a similar nature. For ‘Hellboy’ though, your patience will be rewarded as there are two post credits scenes, both significantly important and hinting at the potential future of the franchise, that is given there is one, which may be a dubious proposition as of now with the film’s poor reception. Moving on, the mid credits scene shows Hellboy drunk talking at his father, Bruttenholm’s grave when Lobster Johnson shows up. Hellboy who is evidently a great fan of Johnson spends the next several seconds plainly gushing over him, when he is quickly asked by Johnson to sober up to deal with a greater evil at play. After ending the conversation, Johnson appears to pass through Bruttenholm’s grave, revealing himself to be a ghost, as Hellboy continues his fanboy moment. 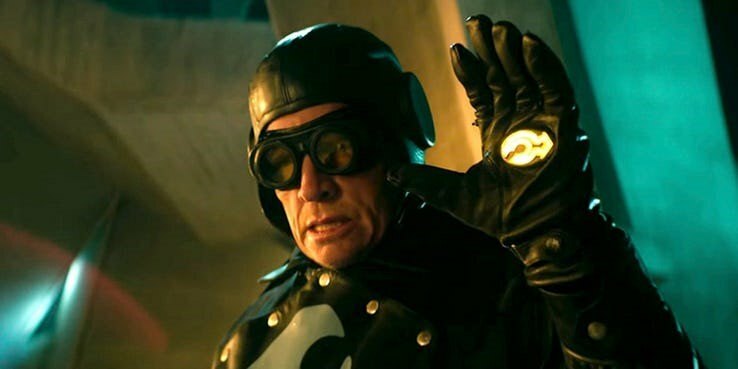 Lobster Johnson also makes an appearance earlier on in the film as a Nazi Killer at the site where Hellboy was summoned by the Nazis to aid against the Allied forces in WWII, but was later adopted by Bruttenholm. In the comics too, where Lobster Johnson is a recurring character marked with a claw that brands criminals, his ghost returns to Hellboy for seeking his help in completing the mission that led to his death. He is also a member of the BPRD, an occult specialist, a Nazi hunter (as shown in the film) and later a frequent ally with Hellboy in the source material too. 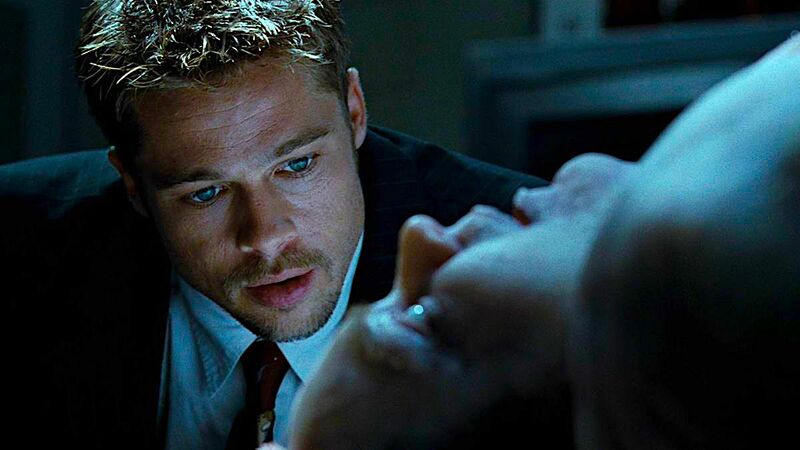 If an upcoming sequel is able to set that up effectively, it may just be completely warranted too. Unlike the MCU films where the end credits scene is usually a gag, the one in Hellboy teases a powerful potential future villain. The end credits scene is completely focussed on Baba Yaga, whose character visualisation was my favourite from the film and genuinely terrifying in parts, complete with her rather rich character history and legend of her freaky house atop chicken legs (you have to see it to admire it). Coming back to the scene, here we see her talking to an undisclosed being, attempting to acquire Hellboy’s eye for herself that was promised to her by Hellboy, following which the latter cheated on the agreement and fled after being cursed by Baba Yaga. She speaks to the being, and promises him a chance to die in return for the eye. 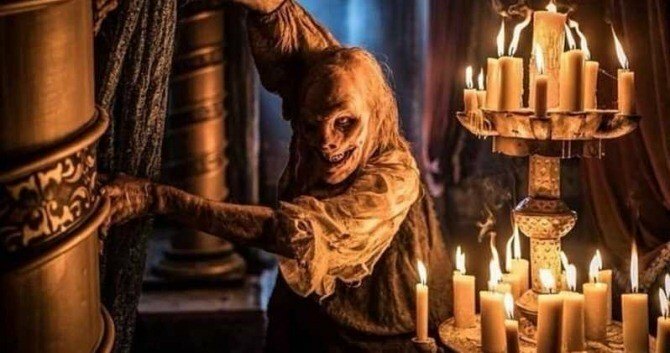 Again, while regular movie goers will have absolutely no clue what is going on, comic book fans will instantly recognise the obscured character as Koschei the undead, or simply Koschei. He is actually a malevolent entity of Slavic origin and an unpopular part of the legend and lore there, much like Baba Yaga, but is also a frequently occurring villain in the Hellboy comics by Dark Horse. The character’s fictional biography would reveal him to be a powerful sorcerer of dark magic and even has shapeshifting abilities along with enhanced strength and physical abilities. His most notable feature though is that he cannot die, having nestled his soul in enchanted objects, for instance a needle. Now this is where it gets really interesting. That very needle is inside an egg, and the egg is placed in a duck, which could be any one of the millions of birds in the world. Thinkk Voldemort but as part of Russian legend and origin. Unfortunately so, Baba Yaga gets to know this secret in the comics and that is how she is able to get a monster like him to do her bidding here, fighting Hellboy for his eye, because she basically has his soul for leverage. Again, an interesting villain tease, given it all materialises in a sequel. There is little that remains to be said in regard to how I liked the film in general, apart from what I have already stated in the introductory paragraph. My primary complaint with Hellboy is that it tries too hard to be too much at once, and if history is any indication, we know how that has ended up for films. It is in parts a goth horror story, that are frankly the better aspects of the film. There are parts whence the makers have tried to add in bouts of comedy that often don’t work and seem misplaced, and bits where we see Hellboy fighting off supernatural threats to the tunes of hard rock. Then there is the inherent struggle that Hellboy faces with respect to his lineage, something that is supposed to add gravitas to the film. The result is a mixed bag, exactly mirroring my feelings for the film. To add to the woes, even the budget slips eventually surface and show up in your face as poor CGI in quite some places. However, that would remain the least of my concerns when it comes to the film that isn’t quite sure what it wants to be, other than a successful blockbuster reboot trying to make it out of the shadow of the erstwhile films. I agree that it is quite a burden and that the film appears to be suffering from exactly that right now, but it is completely bereft of the heart and viewer engagement, something that despite the nature of the characters and stories was Del Toro’s films’ strong suite. ‘Hellboy’ completely missed out on that. As also stated in the introductory paragraph, it isn’t all bad and the film completely works when it is busy expanding on the plethora of comic book lore that we have on the character, which is what the case should have been with the entire film, something that the superior manga adaptation ‘Alita: Battle Angel’ scored on earlier this year. ‘Hellboy’ to a certain degree creates its own brave new world, wherein humans and the supernatural realm have coexisted, even if in the shadows or out of spite. In that, the Arthurian twist in the tale it adds is a good touch, and even the real locations including St. Paul’s Cathedral and most of Britain make things very interesting. Additively, I am kind of all praises for David Harbour’s performance as Hellboy. He is earnest as the character and channels the angst and younger persona of the character effectively. It’s not a question of whether he rises from Perlman’s shadow or not, but whether he should, given he does sufficiently well for himself. It’s the film that doesn’t do him justice. I choose to close the writeup with two appeals of sorts, improbably hoping that they somehow reach the concerned. First, let’s please stop killing Ian McShane in movies, okay? No one’s ready for that kind of mean shock. Second, word to the Indian film certification board who practically butchered the film in their attempt to make it more suitable, yet passing it with an A Rating, the Indian equivalent of the R rating. We are old enough to decide what to watch. Stop censoring stuff unnecessarily. If I go in hoping to watch few monsters being slain by Hellboy and a couple of cuss words peppered throughout, I want exactly that from the film. Nothing more, nothing less.